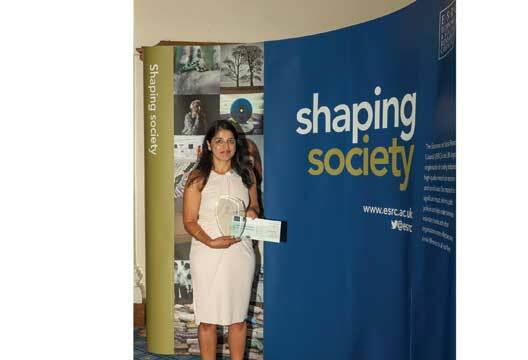 A psychologist whose research has helped to overhaul the way vulnerable witnesses are interviewed has received an award from the ESRC. We spoke to Professor Amina Memon (Royal Holloway, University of London) about her career path and plans to have an impact on evidence-gathering and interviewing among those seeking asylum. Memon’s award for Outstanding Impact in Public Policy marks the fifth year of the ESRC’s Celebrating Impact Prize. Memon, who also received £10,000 prize money, began her research career looking into eyewitness memory in adults, and both the increasing study of cognitive interviewing techniques and high-profile cases of alleged child abuse led her to tackling a tricky dilemma. She explained: ‘There were conflicting views about whether children would make things up as innocent witnesses, or whether they could be competent witnesses if they couldn’t understand the difference between the truth and a lie.’ If the latter was the case, and children couldn’t be seen as competent witnesses, Memon said this raised serious questions on how best to investigate crimes where a child was the only witness. Memon and colleagues adapted the cognitive interviewing technique, which involves a detailed narrative style of reporting, open-ended questions and instructions to reinstate context, and they tested it on six- to seven-year-olds and eight- to nine-year-olds following either an eye test scenario or a magic show. While the younger children struggled to provide much detail, the slightly older, and more verbal eight- and nine-year-olds, gave comprehensive, detailed and accurate testimonies. The interview alone wasn’t the only important part of getting such detailed accounts, Memon said, but the process of building trust and rapport before an interview helped children remember and recount what had happened. Later work showed the cognitive interview technique can also be used for children with learning disabilities and, with some modifications, adults on the autistic spectrum. Further research also showed older witnesses were not more susceptible to confusing their recollection of events with the recollection of another witness. Indeed, Memon’s research review has shown older people to benefit from cognitive interviews perhaps even more than younger people.